A “chocolate beer,” sans additional qualifiers, by no means carries the same level of novelty it did back then. 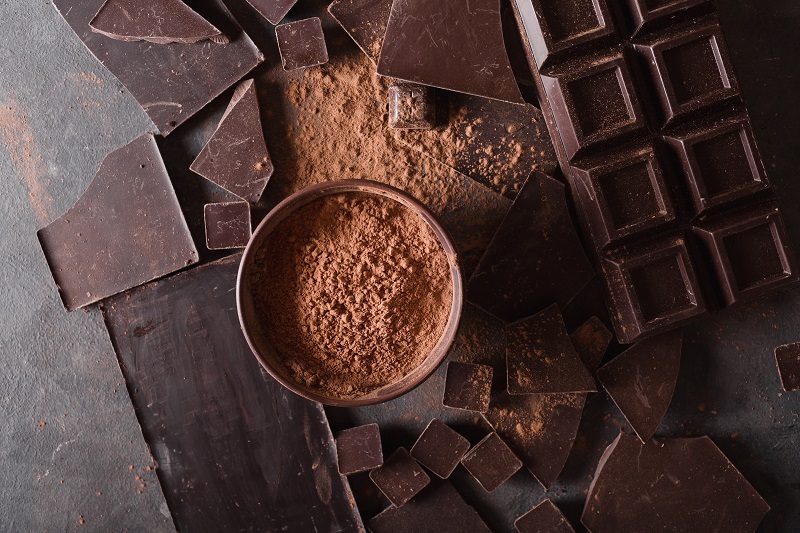 The average person tends to know at least a little bit more about chocolate and its cacao origins, as the industry’s built up a wider discourse, encompassing organic and free-trade origins, cacao percentages, etc. Those language shifts eventually echo in our beer. Certainly, one of the likely causes of any recent upticks in cacao-emphasizing beers has been the success of Cholaca, a Boulder, Colorado-based company that began national distribution of its liquid-cacao product last year. An April press release noted that more than 85 U.S. breweries were currently using the product, while by late 2017 a Cholaca representative indicated that figure had since eclipsed 300 breweries—showing estimated year-to-year growth of around 600 percent. Having mentioned a recent bump in milk stouts in last issue’s Trending, I tried to steer these selections away from a stout focus when possible while still incorporating many of the newer cocoa/cacao releases. There’s a lot of attention on chocolate, today and for years now, and it shouldn’t be surprising to see narrative-minded breweries highlighting that cacao bean more. You’ll find various recently recommended beers, emphasizing cacao or cocoa additions, in the More Recommended Chocolate Beers sidebar. The newest Beer Geek Breakfast release from Mikkeller—for better or worse—happens to be a Vanilla Maple Cocoa Shake rendition. The Bruery’s Chocolate Rain, a bourbon-barrel-aged imperial stout with fresh vanilla beans and cacao nibs from “luxury chocolate maker” TCHO (weighing in at a modest 19.5%), saw its first public bottle release in 2017 and is likely to reappear early on in 2018. And, since we’re already in big-beer terrain: Wild Heaven Beer in Atlanta recently debuted Gravitational Wave imperial stout in cans for the first time—featuring raspberries and smoked cocoa nibs. Good for a quick cocoa fix. Brewed with nibs from Ghana, Ecuador and Madagascar, this chocolate bock is balanced and straightforward with caramel, cocoa and brown sugar. Abuela’s Casita takes its inspiration from the winter beverage head brewer Jason Schlebach’s grandmother often made in Mexico called Champurrado, made with corn, chocolate and milk. (This beer uses corn and lactose, as well as the special adds above.) This lands dark and spicy to start but with a bit of time opens to rich milk chocolate, ample cinnamon and cocoa. The vanilla stays generally quiet until this warms up, otherwise focusing on caramel and soft spice. The cocoa’s a subtle presence alongside roast and milk-chocolate notes. Heavy Seas w/ MadTree Brewing Co. This latest collab in the Partner Ships Series looks to special ingredients sourced near each of these breweries, including coffees from roasters in Baltimore and Cincinnati, and cocoa nibs from Cincinnati’s Maverick Chocolate. Once this warms, a smooth milk chocolate and deep cocoa lead, with those complex coffees smoothing over any overt sweetness. For all the forces at play here, Almanac stays true to form—with the raspberries showing an exceptional vibrance. The aromatics land fruit-first, pulpy and lightly tannic, while the cocoa-nib and Merlot additions offer surprising depth in that first sip. Particularly vinous. There’s all kinds of coconut here: unabashed, unrelenting, mellowed only by that underlying chocolate and rum. (Though it’s not like the beer name is pulling any punches … ) For all the coconut: the imperial porter base is beautifully built, that chocolate presence is seamless, and there’s a lot more going on here than just the coconut-heavy first sip. Sierra Nevada’s barrel-aging profiles often land on the over-assertive side of the spectrum, if engaging and well-matched to their base beers. This edition in their Trip in the Woods series is no exception, with a firm bourbon edge meeting dark chocolate and quite modest levels of coconut underneath (at least relative to that Oskar Blues example). This is not a small beer. While this might not land in that tippy-top echelon of complex impy stouts, there’s a lot of good stuff going on here: the vanilla-bean addition is tempered nicely, there’s deeper cocoa and dark chocolate beside blackberries and dried fruit, and the bourbon barrels contribute a welcome char and spicy warmth. Of the highlighted beers this issue, definitely one of the truest “chocolate beer” experiences. The underlying caramel and leather notes conjure oloroso sherry, and that warming bourbon heat tempers much of the sweetness. But, for those into this sort of thing, it’s still very much as promised: a massive hit of white-chocolate-ness flecked with candied cherry. Brewed with eight different malts and eight hop varieties. The overall effect is quiet on the nib front, focusing instead on chewy core caramel and firm (if nondescript) bitterness. This special edition of Frambozen uses locally roasted and ground cocoa husks via Nuance Chocolate. The end result’s surprisingly hollow and sticky, its cocoa overwhelmed. This latest incarnation of Ground Control (using Ninkasi’s space yeast) is aged in Woodford Reserve bourbon barrels, with 10% of the final blend being a fresh/unaged batch of the base beer. Hints of acetaldehyde and higher alcohols detract from an otherwise sturdy core.